Throughout December 2018, look for decorated banners that highlight places in town with stories found in the quilt. Can you find them all? The clues and their stories are listed below. Or, if you prefer, download your copy and take it with you as you discover Victorian Melrose. 1) This 19th Century Greek Revival building hosts arts exhibits and is where the Melrose Hospital Association was formed in 1893. Constructed in 1828 as a summer retreat, this building hosts monthly art exhibits and office space for community groups. 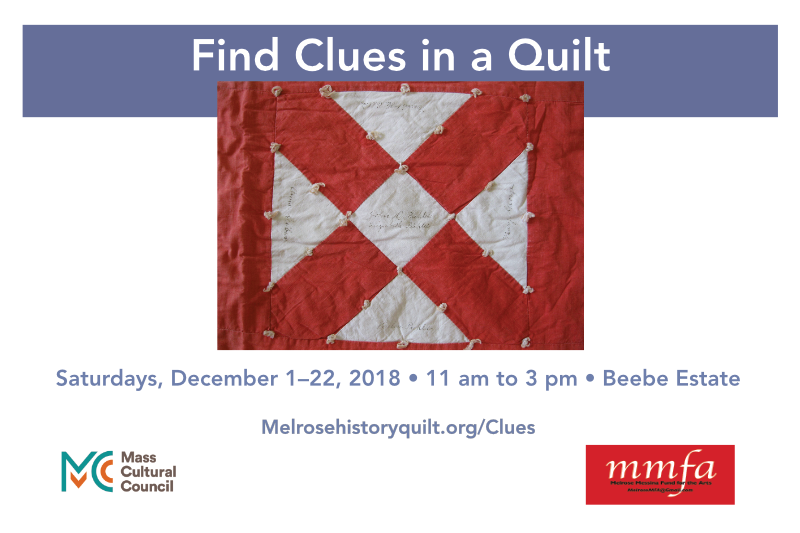 In December 2018, Melrose celebrates the return of an inscribed quilt in Stitched Connections exhibit. The homecoming celebration story for this quilt begins in 2015, when Jane Anderson asked Ann Wasserman to repair and conserve a quilt she purchased at a garage sale in Williamstown, MA. Ann began by measuring and evaluating the quilt. Made of red and white “Old Italian” blocks, the block was also known as the “Snowflake” block or “Old Italian Design,” according to Barbara Brackman’s Encylcopedia of Pieced Quilt Patterns. The more than 200 names penned on the quilt tickled Ann’s curiosity. Using her membership in Ancestry, she started researching names. She discovered that nearly every name on the quilt lived in Melrose in 1900. 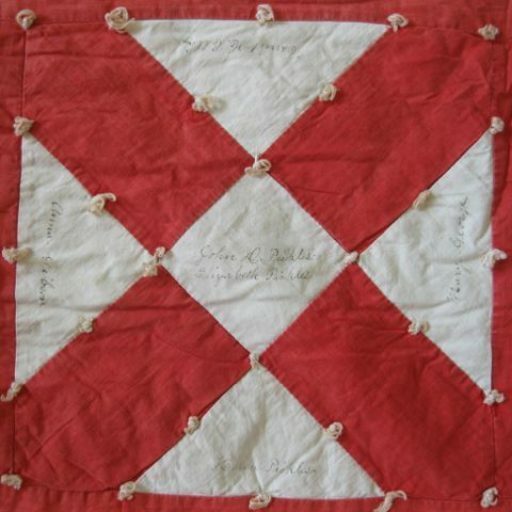 Using church membership directories and census data, she pinned the quilt date to 1897 – 1898. The quilt was probably a raised funds for a church or community project. People would donate money to have their name on a quilt block. When complete, a raffle or auction would raise additional funds. Hear more about the quilt repair process and Ann’s research discoveries in her talk on December 8 at 1 pm at the Beebe Estate. 2) The southern Melrose playground was a center of industry throughout time. Kids play ball and swing at the Lebanon Street Playground in 2018, but this area has hosted a long history of industrial activities. Native Americans quarried Melrose Green Rhyolyte from the rock ledges behind the playground centuries before English colonists arrived. Lebanon Street was the first major thoroughfare in Melrose or “North Malden” as it was known before 1850. The Wyoming Cemetery opened in 1889. Founded in 1853, the Boston Rubber Factory became the largest employer in Melrose. Owned by Elisha Converse, the factories in Malden and Melrose, made 33,000 pairs of rubber shoes a day, employing 2,700 people in this area. Herbert and Christina Chandler’s names are found on the Melrose History Quilt, and they lived just south of the Playground. Christi was the matron of the almshouse or poor farm, lodging for eldery or disabled people who had no other lodging options. In 1900, five people called the poor house their home. Three of these were over 75 years old. In 1897, the City stone crushing plant was moved to nearby Sylvan street, using the material for various road building and maintenance projects. 3) In 1900, this newly constructed downtown building hosted the Melrose Public Library. Since its establishment in 1890, there was great excitement about the Melrose Young Men’s Christian Association. They envisioned a place for non-denominational religious study, public meeting rooms and a well-furnished gymnasium. Citizens financed this project quickly and the building opened to the public in 1895. Melrose citizens were proud of its landscape and accomplishments, especially since it only became a town in 1850. Known as North Malden before then, the arrival of the Boston and Maine railroad changed the character of the area. In 1900, Melrose had a population of 12,500 – a 1,000% increase in 50 years.The downtown business district boasted sidewalks. Horse drawn trolleys provided public transit up and down Main Street before motorized vehicles replaced them in the early 1900s. 4) In 900, this one block long street west of the City Lot was home to 15 people named on the quilt. Five houses on this one block street provided 15 signatures on the Melrose History Quilt. Vine Street shows us a microcosm of the housing arrangements in 1900. Multi-generational and extended families living together in one house were typical. Nieces lived their aunts or uncles, especially if they were seniors. Widowed sisters may share a home or live with brothers and their families. Two or three generations of family frequently shared the same house. In 1900, the Melrose Business Directory listed four official boarding houses. Other boarding situations were more informal. Young workers without family, seniors or young couples frequently opted to board. Most boarding houses in Melrose rented four or five rooms. Live in servants were not uncommon. Nearly always, they were female immigrants from Canada, Scotland, Sweden or Ireland. 5) Melrose's first religious society built their church building here in 1876. Looking to reduce the long travel to Malden for Sunday services, the Melrose Methodist Episcopal Church was established as a religious society in 1813. Services were held in school houses, homes and other public spaces before building a church here in 1874. By 1895, the steeple was unstable and the building too small for the number of people attending services. In 1900, there were 12 churches in Melrose – a town of 12,500. The Methodist Church was one of the most attended with nearly 600 active members. The Church as we see it today was built in 1904. The names of two Methodist ministers are found n the Melrose History Quilt. John Pickles, with her first wife Elizabeth was minister from 1883 – 1885. Pickles performed the marriage ceremony of three couples listed on the quilt. Joel Leonard was minister from 1897 to 1900. He married John Pickles to his second wife, Lucia Seavey and three other couples who are listed on the quilt. It is possible that the Melrose History quilt was organized as a fundraiser to renovate the parsonage of the Methodist Church (the parsonage is the gold house next door, 647 Main Street). 6) This parkway did not exist in 1900, but the neighborhood Victorian homes did. Elbridge Goss described the Middlesex Fells in 1902 as “….wild and romantic. In the very centre slumbers the ever beautiful Spot Pond….” The Metropolitan Park Commission had recently approved the study of a parkway to link the Fells with the Lynn Woods. By 1911, the parkway had reached Ell Pond, but it wasn’t until 1929 when route 1 was proposed, that the state provided additional funding for the parkway. The Middlesex Fells was a popular destination for Sunday strolls and picnics. Families who could afford to ride horses as a hobby enjoyed the more than 20 miles of bridle paths. 7) This center of learning was the site of the Melrose High School until 1897. In 1897, this was the site of the Melrose High School. In 1900, the Melrose Public Library was housed in the newly built YMCA. This was its third location in 50 years. Citizens decided that a larger, permanent structure would best serve the City. They submitted a funding request to Andrew Carnegie, an immigrant from Scotland who built the largest steel company of the 19th Century. Carnegie’s grant stipulated that the City show financial commitment to the project and keep the library free to all. Thanks to Carnegie’s philanthropy, 2,500 libraries were built in the US and around the world. The library opened in 1904. The Library expanded in 1969 and renovated in 1990. 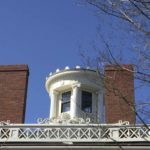 In 2017, a plan was approved by the Massachusetts Board of Library Commissioners for partial grant funding of updates and improvements. The City hopes to receive funding in approximately three to five years. Come to Ann Wasserman’s lecture on December 8, 2018 at 1 pm at the Beebe Estate. Please RSVP so we can save you a seat.